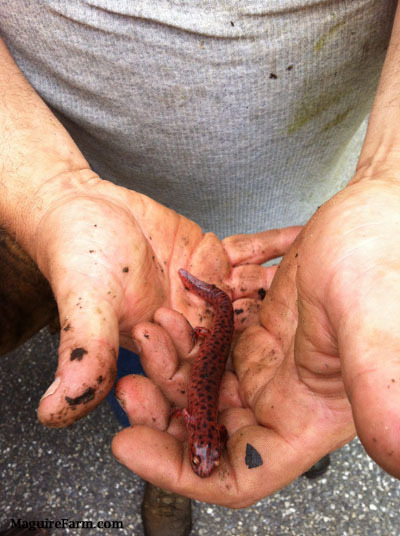 Maguire Farm's care-taker Bob caught this Northern Red Salamander in the springhouse. 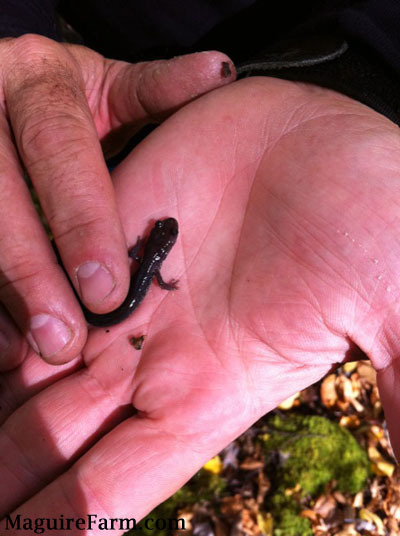 This is a Black Salamander caught out of the pond at Maguire Farm. This slimy little guy hold true to his name as the Slimy Salamander (Plethodon glutinosus glutinosus) and was found in centeral Pennsylvania. There are around five hundred and fifty species under the common name salamander. Mature salamanders will have a long body, four limbs, long tail and have a lizard-like appearance. The average salamander will have four toes on their front legs and five toes on their back legs. Salamanders will eat small insects by shooting their sticky tongue to capture its prey. If they are close enough to their prey they might lunge at it grasping it with their jaws and small teeth. To escape predators some salamanders will use what is known as tail autonomy. This is the process of the tail dropping off of the salamanders body and wiggling around long enough for the salamander to escape. Salamanders will grow back any lost limbs with in a few weeks because they routinely grow back complex tissue. 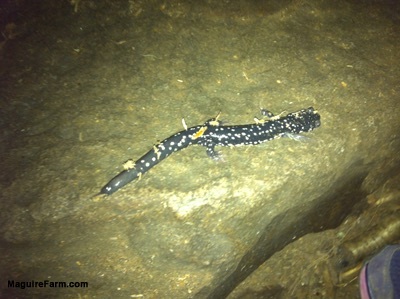 Some salamanders are poisonous and will secrete a white milky poison. Salamanders have very moist skin so they need to live in or near water. They can be found near streams, ponds, rivers or other constant bodies of water. If you are hunting for salamanders be sure to check under moist leaves or rocks.